To make the crumb, preheat the oven to 180°C. Heat the grapeseed oil to 200°C in a pan and fry the breadcrumbs until golden. Remove and drain on paper towels to remove excess oil. In the meantime, spread the sesame seeds out on a tray and toast in the oven until golden brown. Combine the Panko, sesame seeds and miso powder in a bowl and set aside. For the miso & ginger dressing, add 40g water to a bowl and add all the dressing ingredients, whisking well to combine. Set aside. To cook the bok choi, bring 2 litres of salted water to the boil and blanch the bok choi for 1-2 minutes or until tender. Remove and plunge into ice water. Drain and set aside. 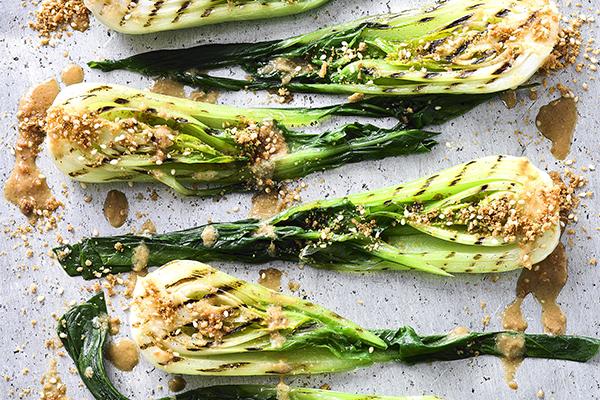 Preheat the BBQ and grill the bok choi until noticeably charred. Remove and lightly dress with the miso dressing. Top with the Panko and sesame crumb.